Welcome to the third day of the StencilGirl and Ken Oliver Crafts Hop. I immediately went to work. I was very pleased with how vibrant these powdered pigments are! Color Bursts are really Intense! Because of their intense colors, I thought of Marbling Paper. But because they are water soluble I knew I needed something besides water. Hmmmmm....didn't have any glycerin on hand. and they worked equally well. in some of the test runs. I used photo paper because it had a nice satin finish and it was a good size to experiment with. Still... Oh My.... These turned out Luscious! I was loving the outcome so I kept on going! Okay....I have the Color Burst part of the project done...now what? light and happy with the promise of warmth and sunshine! I put the Be Bold Be You part across the top. The Fly Soar Leap part shows across the bottom of the book. I thought the orange would look best against the green. I envisioned doodling on and around the circles. and knew that would be perfect as a center point. as well as the Color Burst's as watercolor paints. The original Color Bursts did not bleed off the photo paper. it was ON the satin photo paper or a combination of both. then sprinkled the Color Burst Powder on to it. The pigment powder soaked in and blended nicely. I love my springtime sketchbook! prizes when this week long Blog Hop event is over? $50 gift certificate from StencilGirl. Then head on over to the other blogs to find out about their prizes! Here is today's line up for some colorful projects! I will be back in the Hop Line Up on Friday with another Color Burst project! I love how you did this journal. Beautiful! Wow, beautiful colors, beautiful layout! All the possibilities! Love how you used these pieces as a base for something new! I love how your journal turned out, very cool! 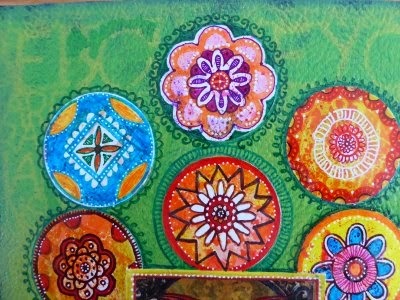 Love how you created the circles and just continued to add more dimension to them. Neat idea! Awesome work! I love the oil technique! Great idea for a journal cover! Love the colors! Very nice! Love the colors and design! Just gorgeous! 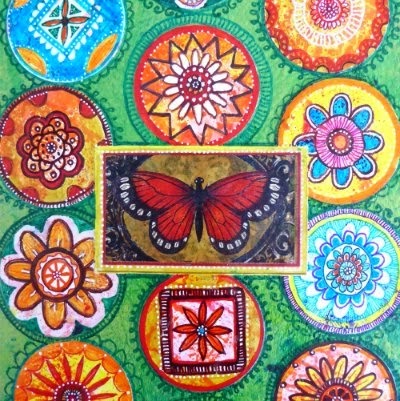 love the mandalas you doodled! This is gorgeous! What a great idea to try the marbling, and your cover design is beautiful... love this! Really interesting how you played with the color bursts. Love the journal results. Nicely nicely done....love the idea of punching out the circles. LOVE these vibrant color bursts. And, your journal cover turned out beautifully! the album is so pretty. Love all of the test patterns from the Color Burst. I'm looking forward to getting the powders and playing with them. Brilliant and creative! Love this! All this creativity is just mind-boggling! Loving it! That's gorgeous! I love how you embellished the circles. Interesting about the oil. I have glycerin, so I shall try that! Very creative combination of techniques and beautiful results! Thanks! Those color bursts look like they're wonderful and lots of fun. I love what you did with your experiment using circles, doodles, and ending up with it on the journal cover. Thanks for sharing all this wonderful art......Linda E.
Very nice project! Thanks for sharing! Love the use of the oil! Good thinking! Just beautiful! Your project looks like it was so much fun to make. I cannot wait to try Ken's color bursts. They have so much color and looks like so vibrant. Thanks for sharing makes me just want to play and experiment. Love how you kept adding to the base circles & enhanced them on the sketchbook. Really ready for spring. Thanks for the tutorials. I love the technics you used. what a great idea - makes me think mandalas! Okay...that is thinking! Cool technique and FABULOUS doodling and love the stencil in the background to add some extra texture!!! What a fun and creative project. I love how each piece looks when you design on it with the color blasts. very neat. Wow! That Colorburst looks like an amazing product! Love the resulting project. This is my weekend to play with my brand new color burst. Love your ideas for use! I love every single step of this project and am definitely going to try it out. 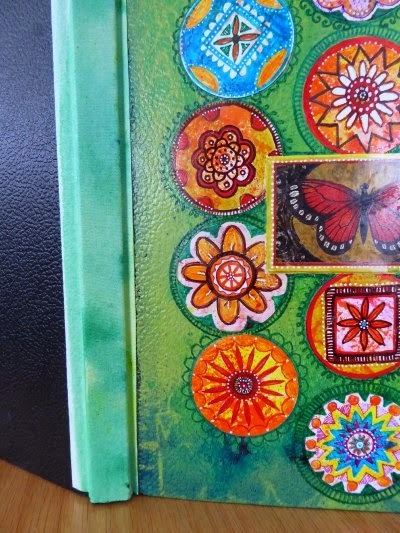 Your journal is amazing--your doodling, the layout, the butterfly, the colors. This is just stunning! What a way to use the color burst! I love the technique and where you took the papers with your fantastic penwork! What a happy accident that it didn't make as expected. They look very organic and beautiful. Great project. Love love love what you did...it is absolutely fantastic. Thanks. Fantastic! I love your journal cover and how your amazing pen work added so much interest and joy. Nice work. I think I will try this on Yupo paper instead of photo paper as it will have just a tad less sheen. OK, so Color Burst is amazing - love your technique! Thanks for sharing!! your project is awesome. Got to have some bursts of color. beautiful work-love this product the more i see how versatile it is. So pretty, love all the colors.